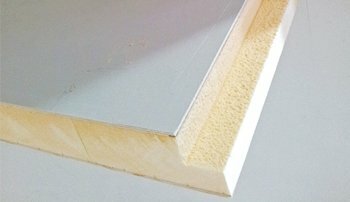 OUR REVOLUTIONARY COMPOSITE PANEL TECHNOLOGY IS UNIQUE TO US WORLDWIDE. DEVELOPED AND DESIGNED IN-HOUSE. 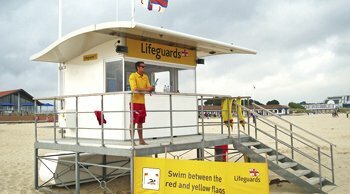 IT ENABLES US TO OFFER A RANGE OF PORTABLE BEACHFRONT BUILDINGS DESIGNED TO LAST 20 OR MORE YEARS IN THE HARSHEST ENVIRONMENTS, MAINTENANCE-FREE. Composite is a high-performance building system, offering superior insulation, structural strength and durability over traditional construction methods or systems. Manufactured up to 10m x 3m without joins, each panel is bonded for rigidity, impact resistance and water tightness. There’s no warping, shrinking, rotting or colour fading, and interesting shapes can be created like our Wave Roof design. We first introduced our revolutionary composite panel technology more that 30 years ago. It offers maximum durability in harsh & coastal locations allowing our buildings to thrive where others would struggle, and is totally unique to us. We manufacture the panels in various thicknesses and layups depending on the intended application. Whole panels are bonded together to form the floors, walls and roofs. This creates a super strong, lightweight, self-supporting structure. The outer surfaces of our bonded composite panel consist of layers of smooth, highly-durable, wipe- clean GRP (fiberglass). These surfaces are white as standard, and we offer a range of RAL colour options. The colour runs throughout the GRP and won’t fade with sun exposure. The smooth exterior can also be wrapped in vinyl graphics for branding or marketing purposes, or if you’re looking for that traditional timber aesthetic, we’ve developed an effective composite cladding system. We are able to replicate traditional looking buildings into completely composite ones with the same visual aesthetic but with the added benefit of a much longer lifespan and the fact that they are maintainence free! 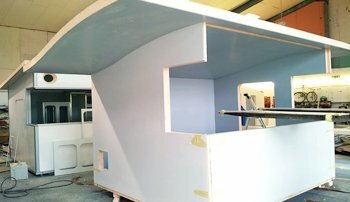 Take a look at our impressive Bespoke Beach Huts.